Ice Carving is our passion. We participate in the world championships and the most prestigious competitions of ice sculpting in the world, where we refer spectacular successes, for example Vice-World Championship in Ice Art in 2010 and 2011. This allows us to continually improve themselves, learn about the latest trends and carry out the ice sculptures at the highest quality. Our headquarters is in Poznań, but we realize even the most sophisticated projects all over the world. Distances do not limit us, we have our own refrigerated transport and 13 years of experience in sculpting in ice. Robert Burkat and sculptors who work with him are the only Poles invited to participate in prestigious competitions and championships and to the implementation of large, complex ice projects around the world. 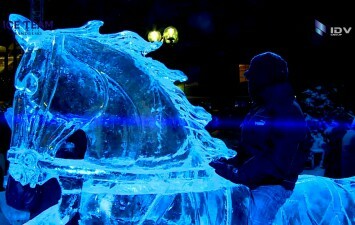 We organize ice festivals and cooperate with TV stations. Artistic ice sculptures: advertising sculpture, decorative and theme sculptures. We encourage you to familiarize yourself with our offer, where we present a sample of our capabilities, at the same time we would like to inform you that these are just examples of our possibilities.